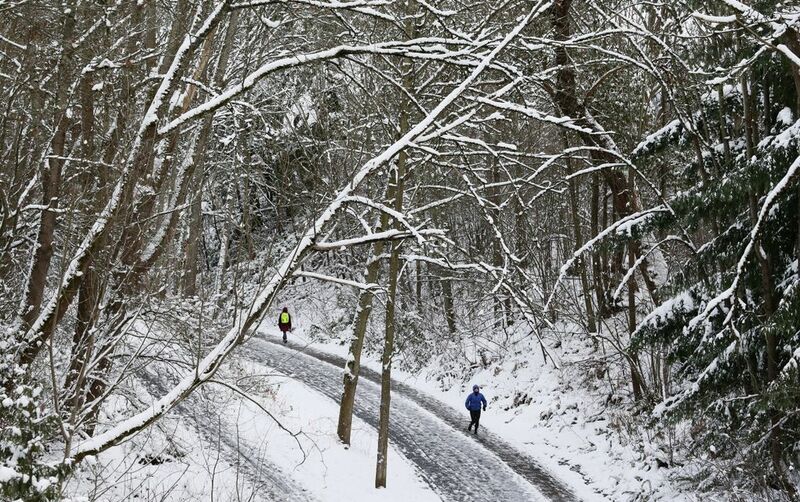 It was just a few inches of snowfall, but that's all it takes in the Seattle area to snarl commutes and cancel classes. 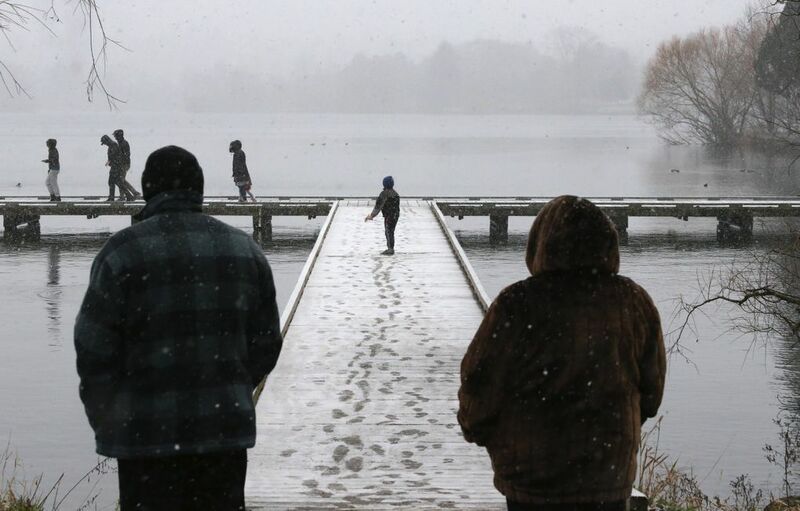 Now with cold lingering, the white stuff is expected to stick around. 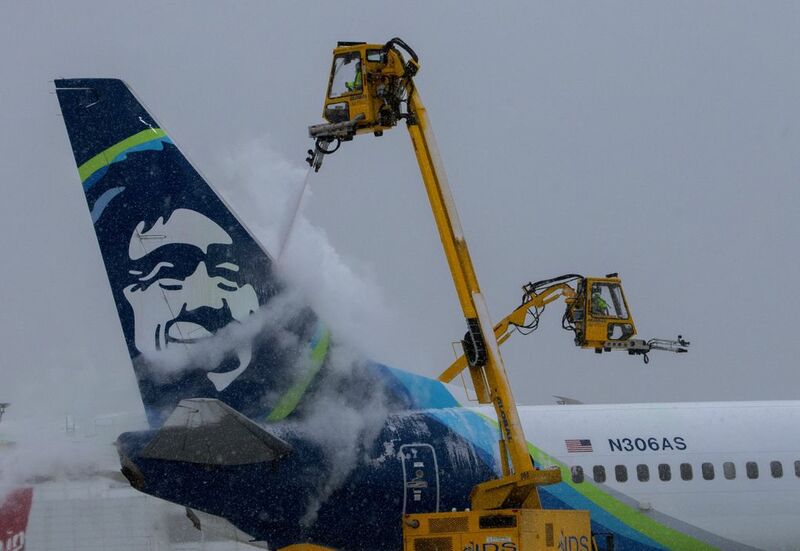 The snow and wind that blanketed and battered the Seattle region Sunday and Monday, closing schools, causing power outages, snarling commuter traffic and setting off massive flight cancellations and delays at the airport, is expected to stick around — literally — for a day or two, according to weather forecasters. 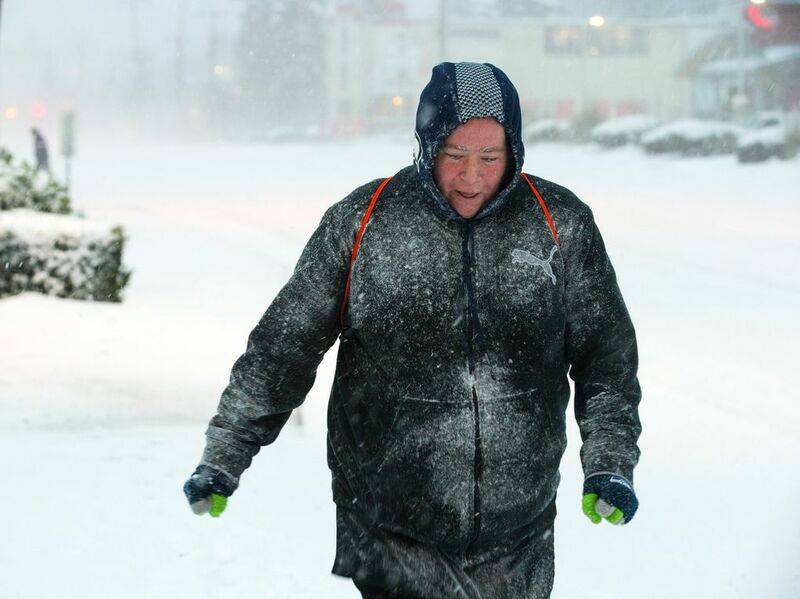 In Seattle, Tacoma and Bremerton, meteorologists with the National Weather Service in Seattle predicted there would be 2 to 4 inches of snow on the ground by Tuesday morning. 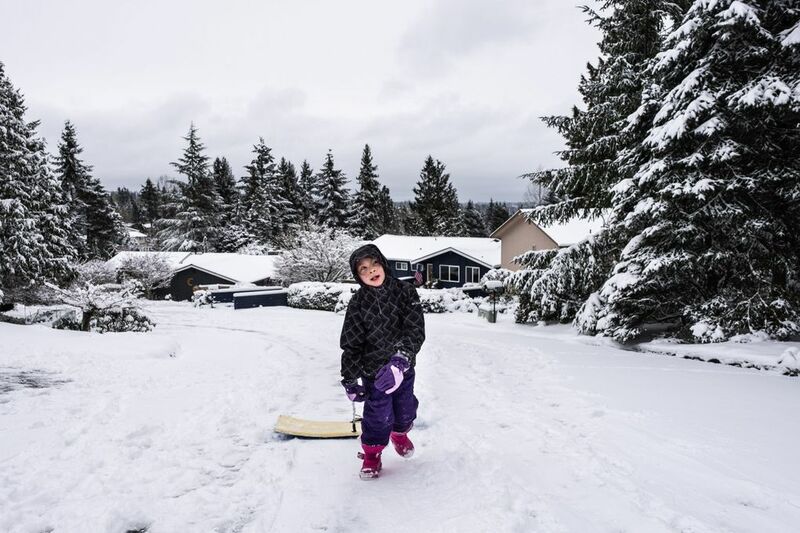 In Everett, Lynnwood, Bellevue, Black Diamond, Gold Bar and Eatonville, residents could see as much as 5 to 10 inches of accumulation. 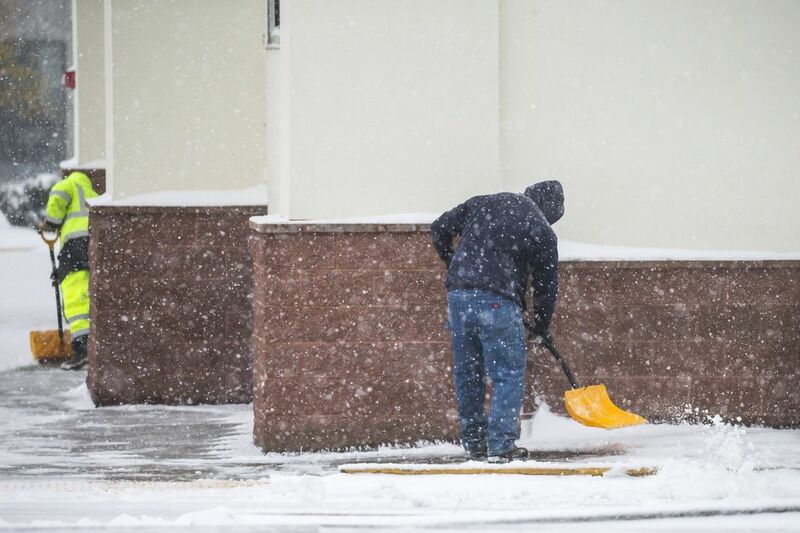 Burg said that Tuesday is expected to be dry, but still cold enough to keep snow on the ground for most, if not all, of the day and possibly beyond, he said. “Honestly, this might stick around for a while,” he said. Public schools in Seattle, Bellevue, Lake Washington, Highline, Shoreline, Renton, Federal Way and Bellingham are closed Tuesday. 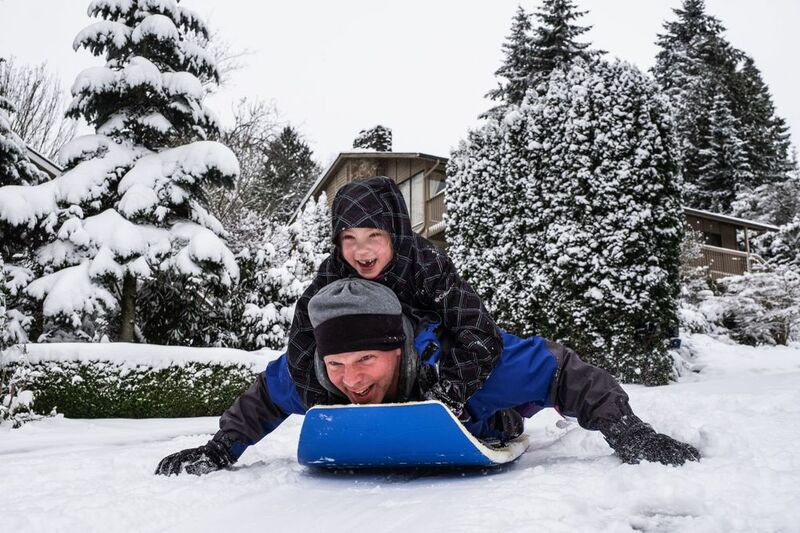 The Kent, Tacoma and Vashon school districts are starting late. Check your school district website for the latest details. It’s possible the morning’s commute could be worse than Monday’s. “It’s going to be equally bad tomorrow morning because everything on the ground will still be frozen and there will be slick spots,” said Burg. 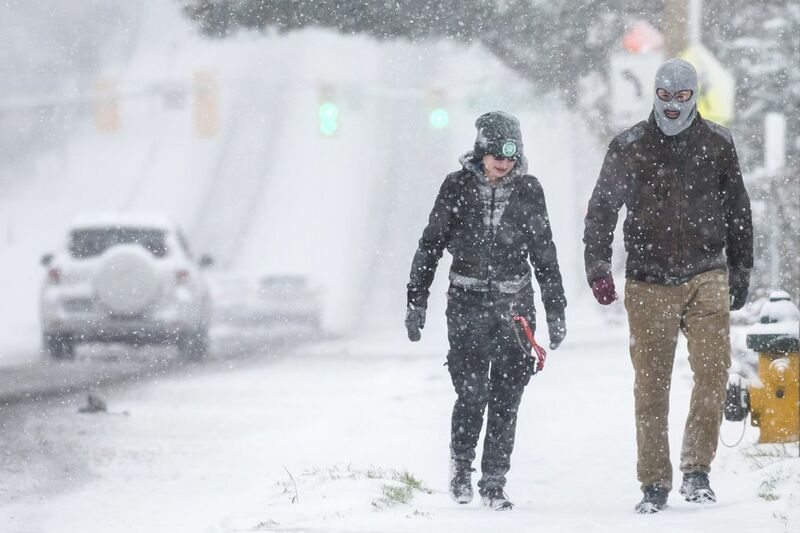 While snowfall was predicted to end Monday afternoon, the wind will continue to blow through early Tuesday at 10 to 20 mph, with gusts up to 30, Burg said. About 10,000 Seattle City Light customers lost power Monday, with the largest failures reported in White Center, Burien and Shoreline, according to the utility company. Shortly after 9:00 p.m., power had been restored to all but 122 customers. 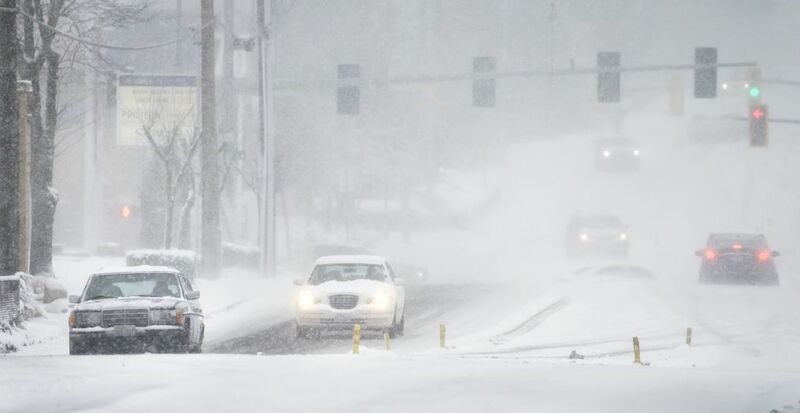 While the weather service was advising people to take a snow day or work from home Monday, Burg said that those who must go in on Tuesday should take public transit or use caution and give themselves “plenty of time” to get where they’re going if using a personal vehicle. 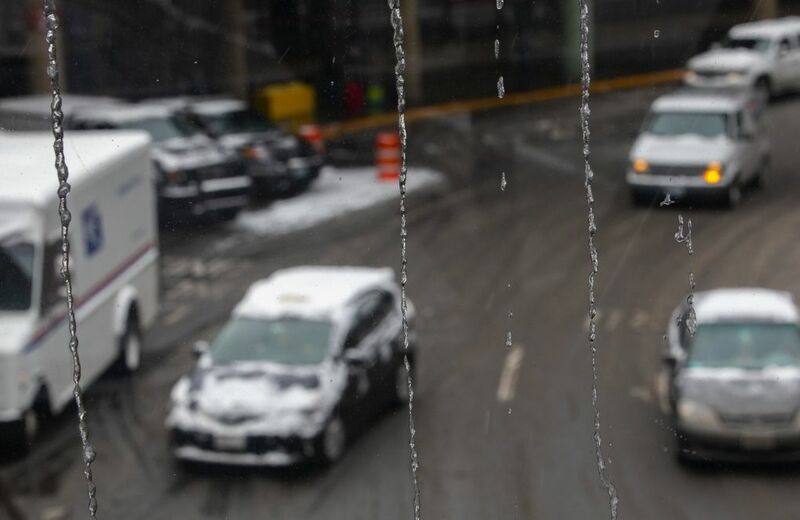 Many people apparently stayed off the roads Monday, but the weather created challenges across the day’s commutes. 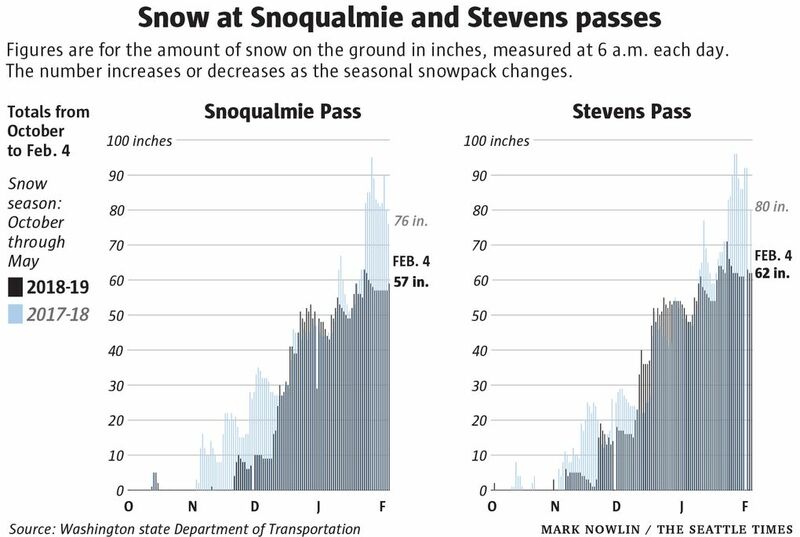 Temperatures remained below freezing, slippery roads caused slowdowns and collisions, and the snowy conditions overshadowed the opening day of Seattle’s new Highway 99 tunnel. 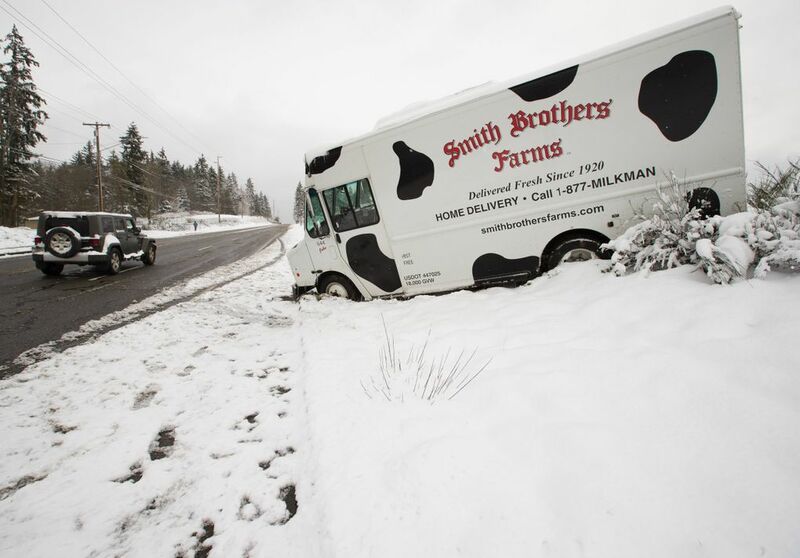 In Queen Anne, icy conditions caused a pileup that began when 25-year-old Tyler Hale’s Northwest Coffee Supply delivery truck slid backward down Second Avenue West. Several other vehicles then collided with Hale’s. No one was injured, Hale said. But drivers left their vehicles in the road for several hours awaiting help. A nearby resident invited the stuck drivers inside and offered them coffee while they waited. 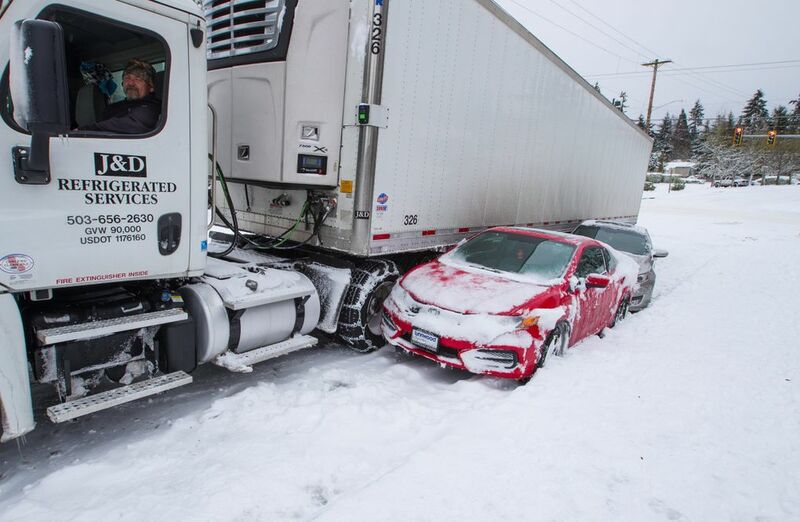 The Washington State Department of Transportation deployed 100 plows and trucks between King County and the Canadian border Monday, the agency said. 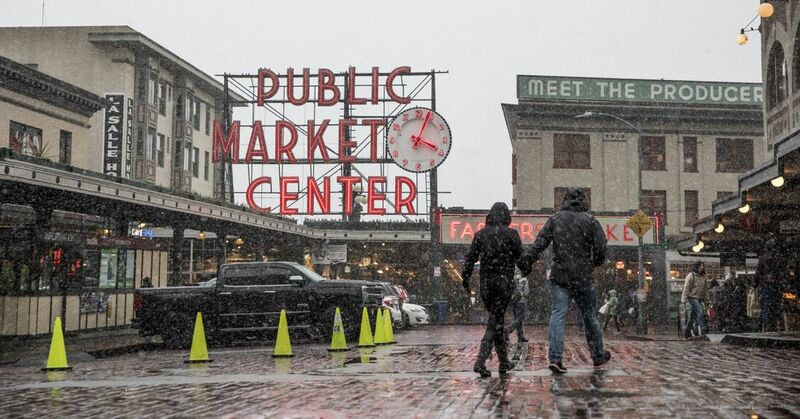 The Seattle Department of Transportation (SDOT) began salting roads Sunday about noon and had about 35 plows and 14 hand crews operating Monday. 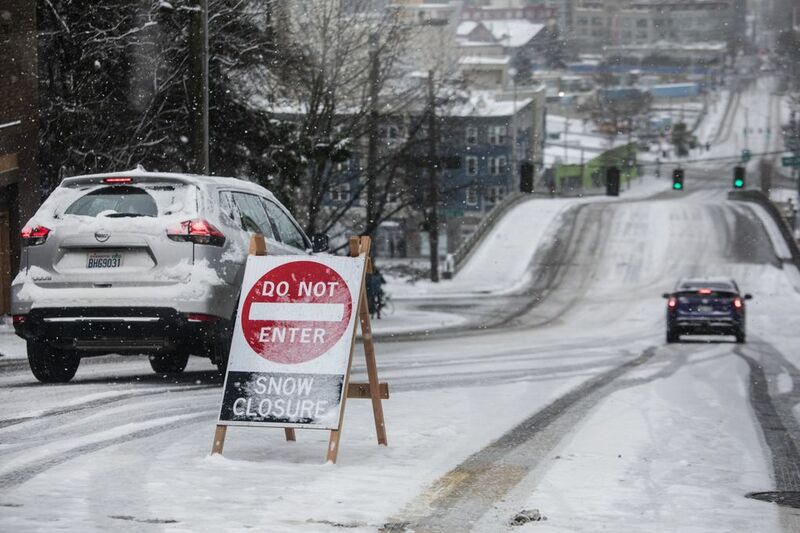 Crews will continue plowing overnight and Tuesday, SDOT spokesman Ethan Bergerson said. “We started off with a full-court press in order to keep these roads clear and we’re going to keep on going with that,” Bergerson said. 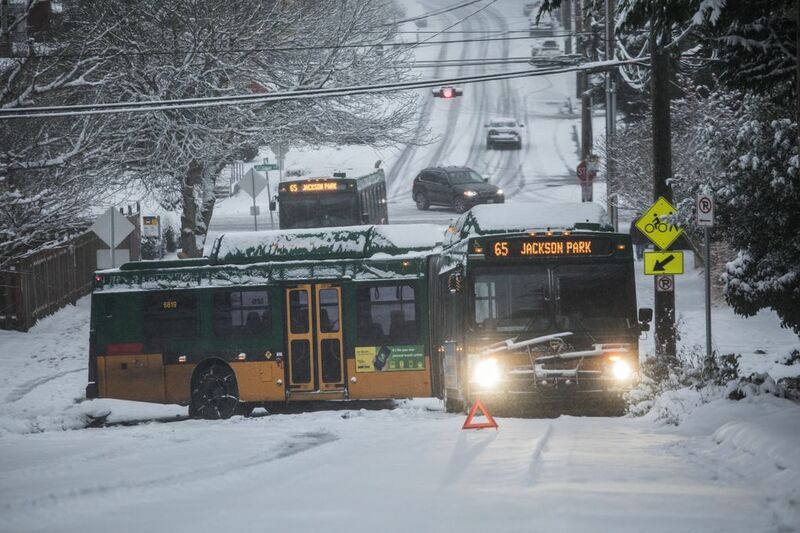 In clearing streets, SDOT prioritizes heavily used routes and those that are key for buses, first responders and reaching major institutions. 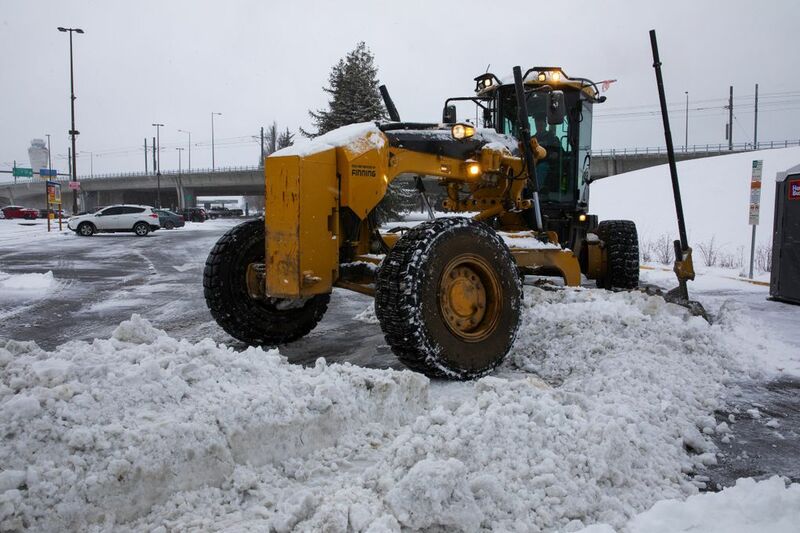 Residents can check the city’s winter weather response map to see how recently roads were plowed. 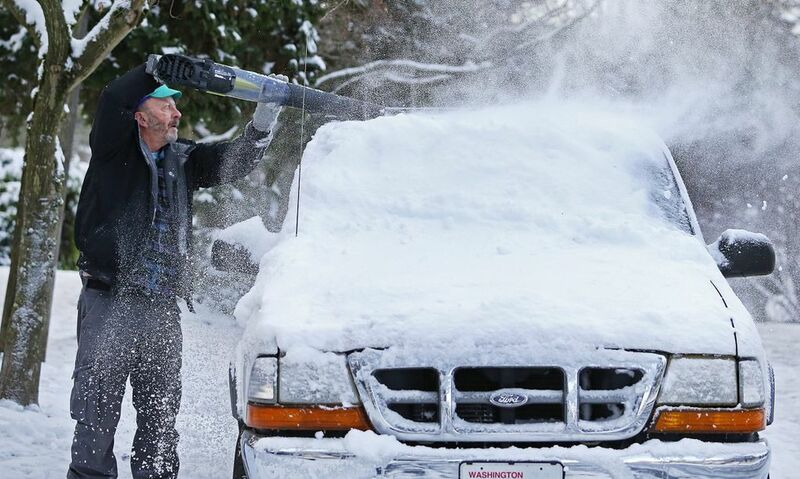 People who can work from home should do so Tuesday, Bergerson said. Otherwise, the city recommends taking transit or driving slowly. 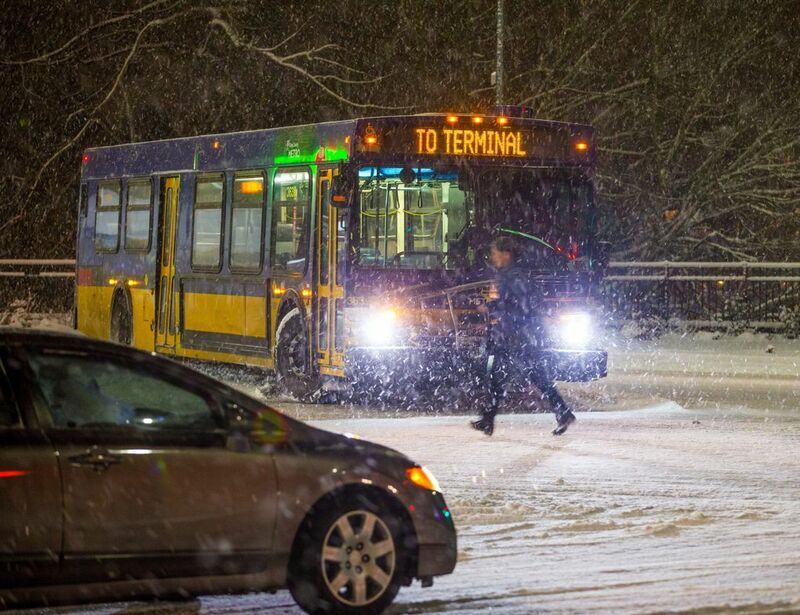 “We’re really prioritizing transit and making sure buses have clear routes, so that’s probably the best way to go for people,” Bergerson said. Ferries sailed Monday, but rough waves shattered a window on one vessel and power outages meant some terminals were dependent on generator power, according to Washington State Ferries. 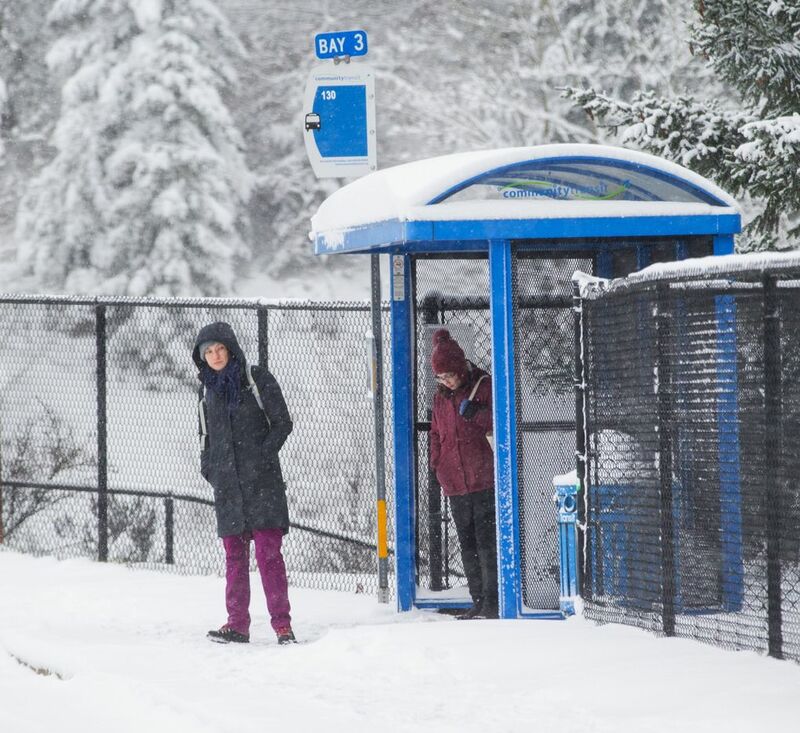 Some Sound Transit commuter trains were delayed due to “high seas” near the tracks and frozen areas, and some King County Metro buses were delayed or rerouted. 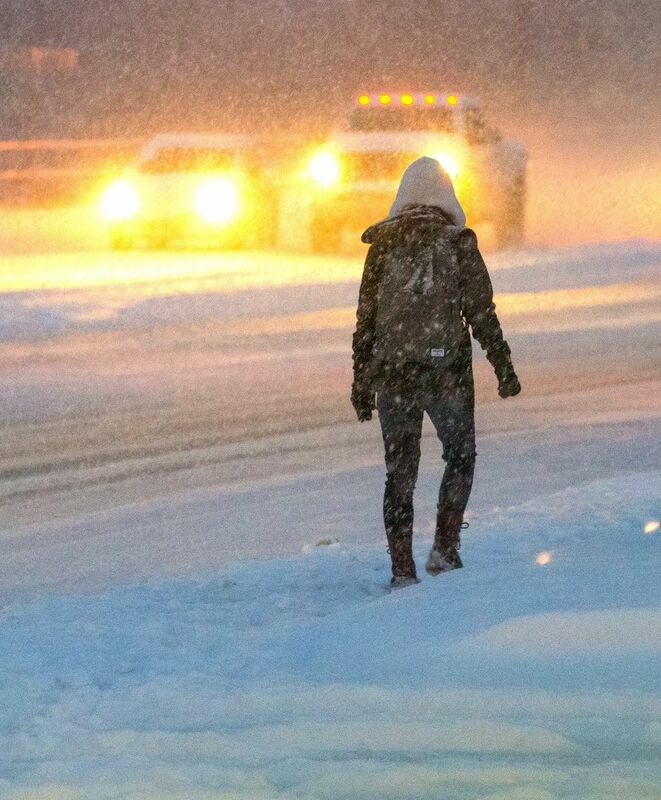 Check the transit agencies’ websites for the latest information before heading out Tuesday. 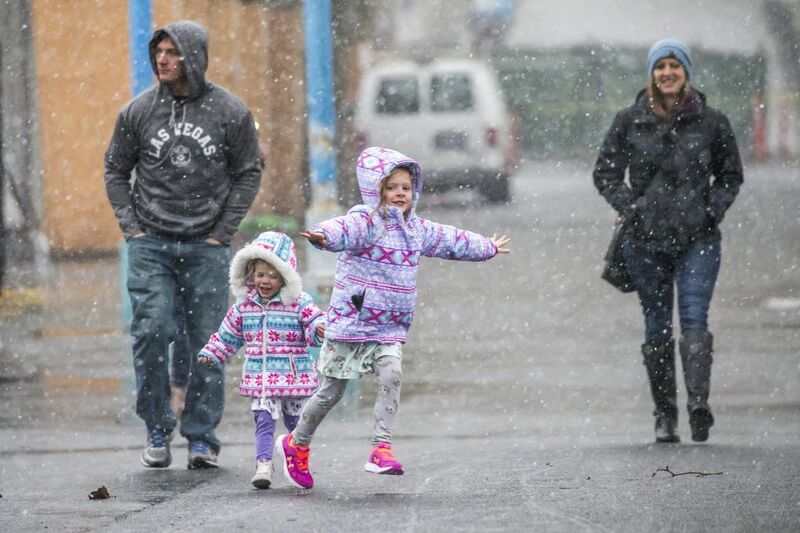 Snow in King, Whatcom, Skagit and Snohomish counties led most Puget Sound-area schools to delay or cancel classes on Monday. 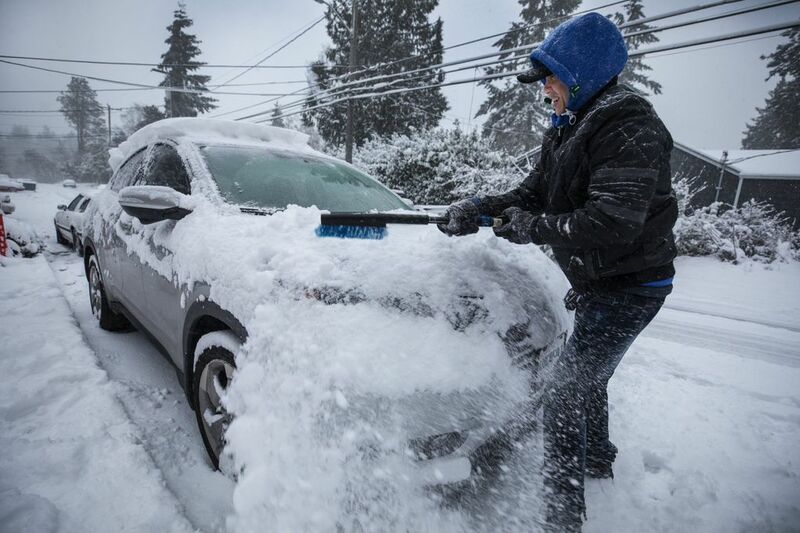 All public schools were closed Monday in Seattle, Lake Washington, Kent, Federal Way, Bellevue, Highline, Shoreline, Renton, Vashon, Bellingham, Port Townsend and Tacoma. 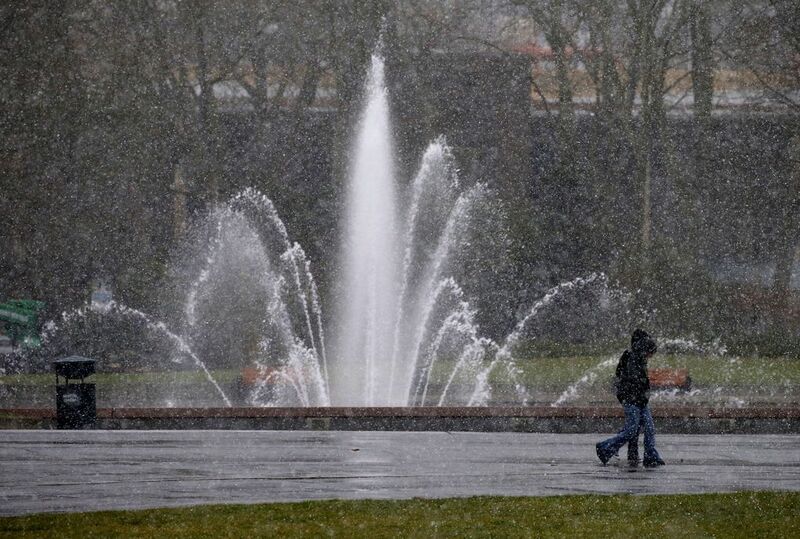 Some area universities also canceled classes on Monday, including those held at the University of Washington’s Seattle and Bothell campuses. 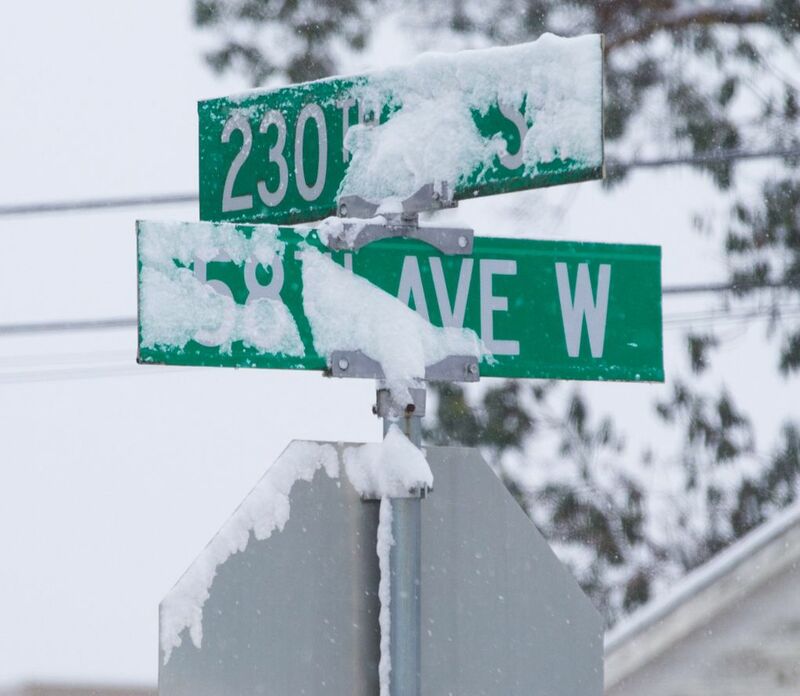 On Tuesday, the Seattle campus is expected to open at 9:30 a.m., while the Bothell campus will delay operations until 11 a.m. School officials will continue to monitor conditions, and updates will be posted on the UW Alert website. 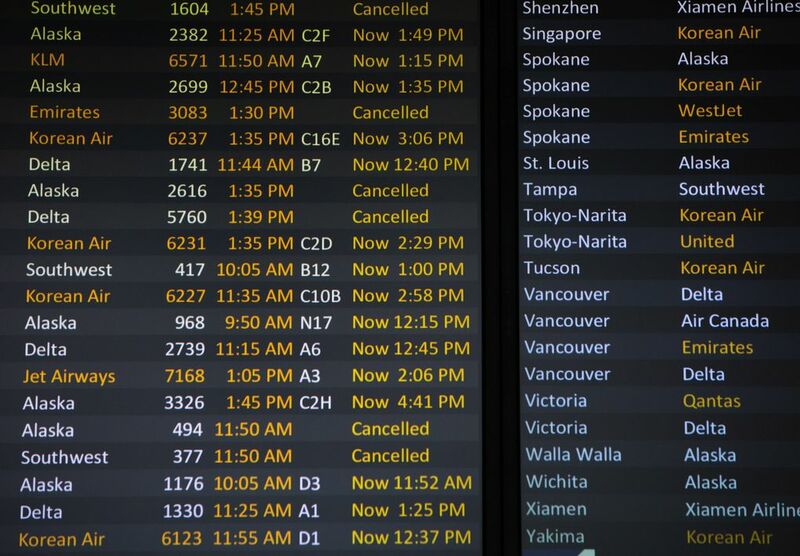 The weather also sparked implementation of a Traffic Management Program for flights arriving at Seattle-Tacoma International Airport, according to the Federal Aviation Administration, and caused massive delays. 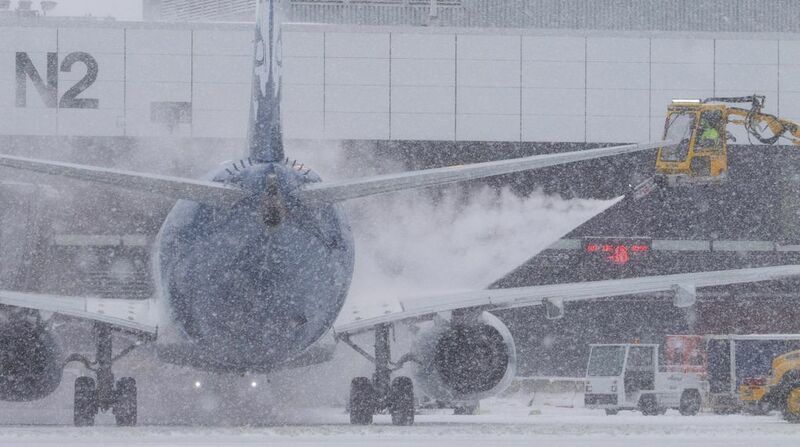 By 4 p.m. Monday, there were nearly 200 canceled flights and about 450 delayed flights, according to Flight Aware, which tracks airport flight information. 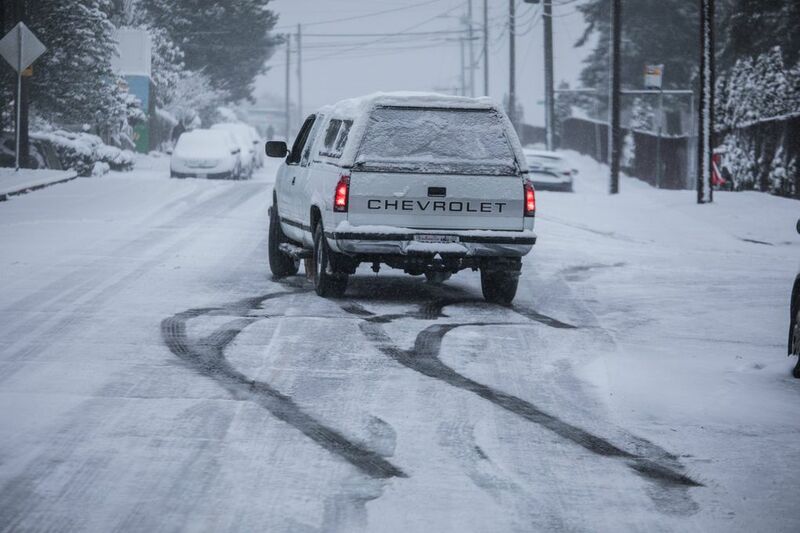 Some mountain passes in the region were reporting that roads were clear but traction tires recommended. 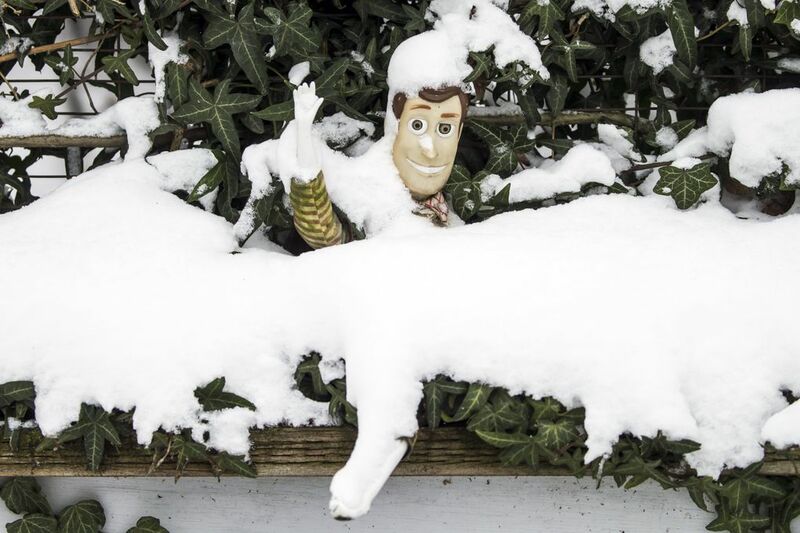 Some Seattleites reveled in the rare snowfall. 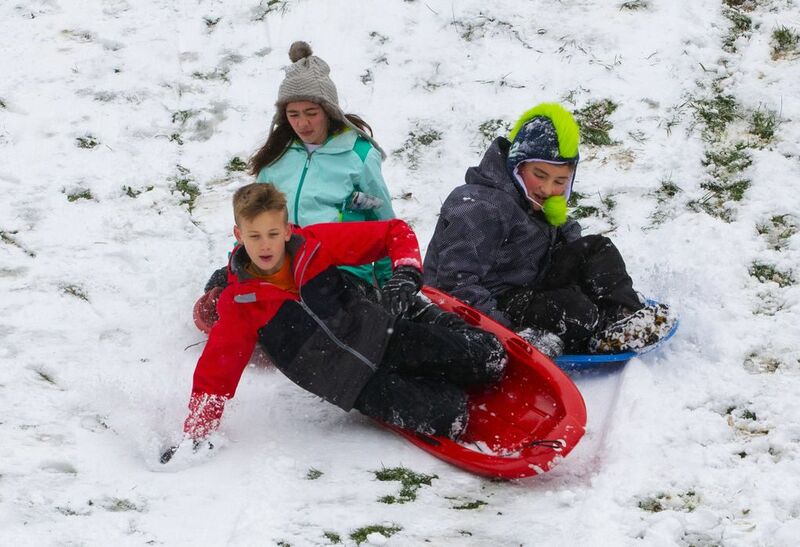 At a popular sledding hill on Northeast 56th Street in Phinney Ridge, parents stood at the top of the hill while children saucered their way downhill. 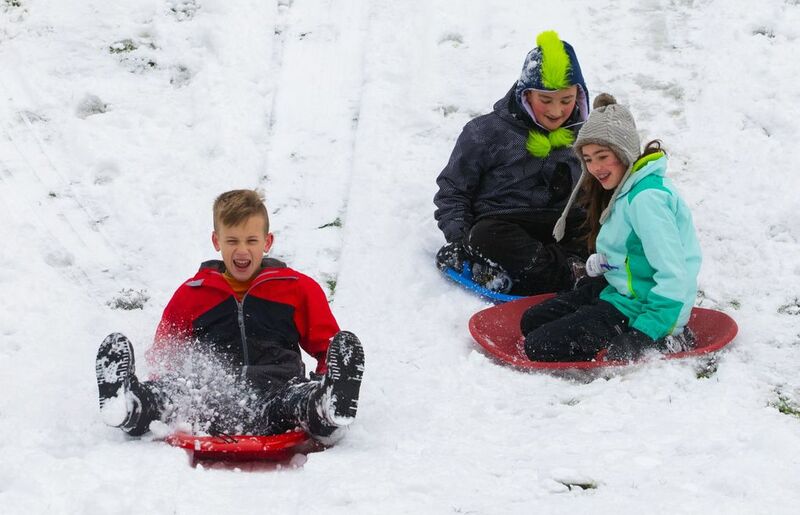 The Graus are from Switzerland, and said that a snowfall like this wouldn’t cancel school there; if it did, kids would never go to school at all. 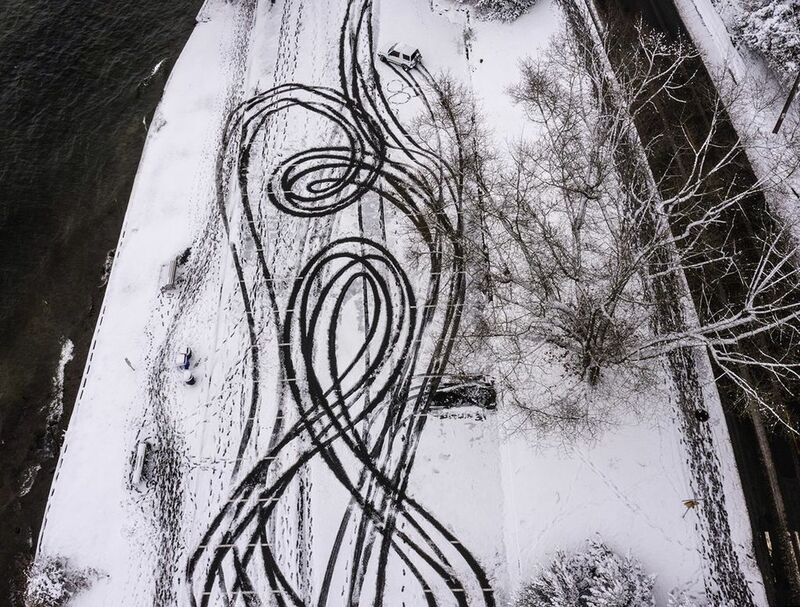 “This is a normal day in Switzerland,” Laurianne Grau said. 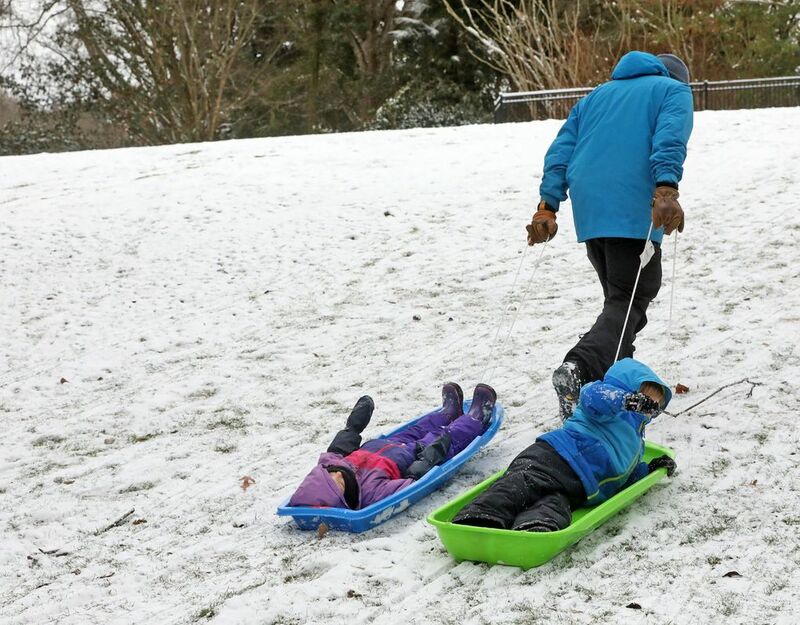 Alex Horner-Devine, a professor at the University of Washington, took his daughter, Annika, and a friend sledding on a popular sledding hill in lower Woodland Park. 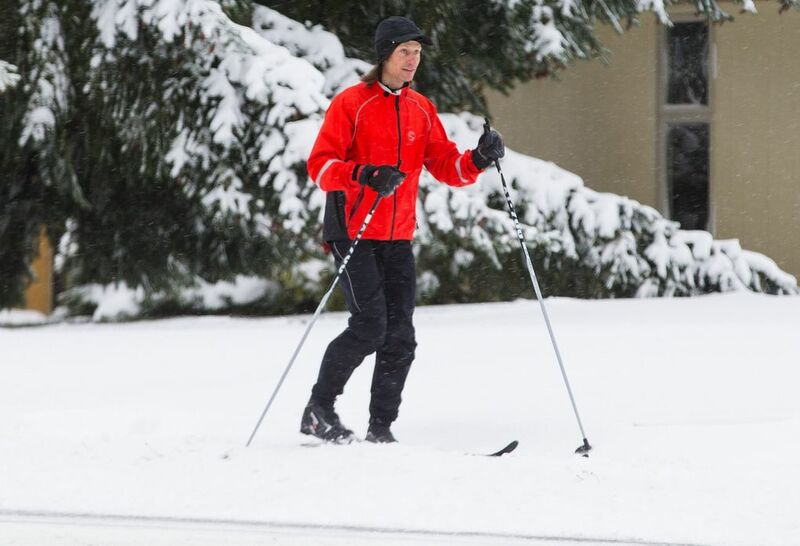 Horner-Devine followed the girls on a pair of used cross-country skis he bought specifically for Seattle’s rough streets and marginal snowfalls. 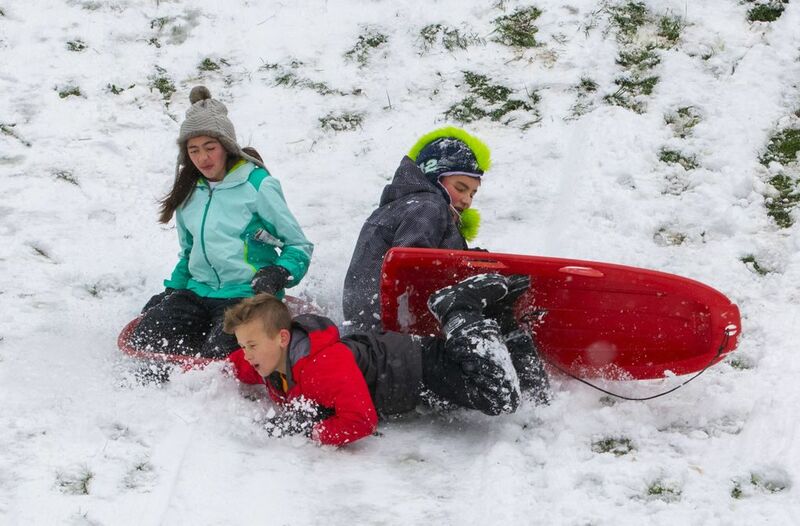 By 11 a.m., they were heading home down 59th Street on Phinney Ridge, the girls sliding down an icy sidewalk and Horner-Devine following on his skis. 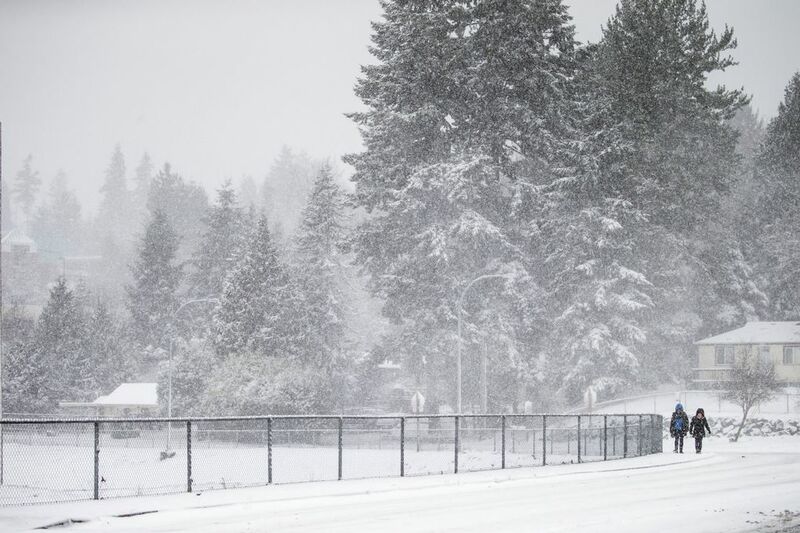 Since classes were canceled Monday at the UW, Horner-Devine wasn’t missing anything. After a morning of sledding. “I’ll make some conference calls fit around hot cocoa,” he said. 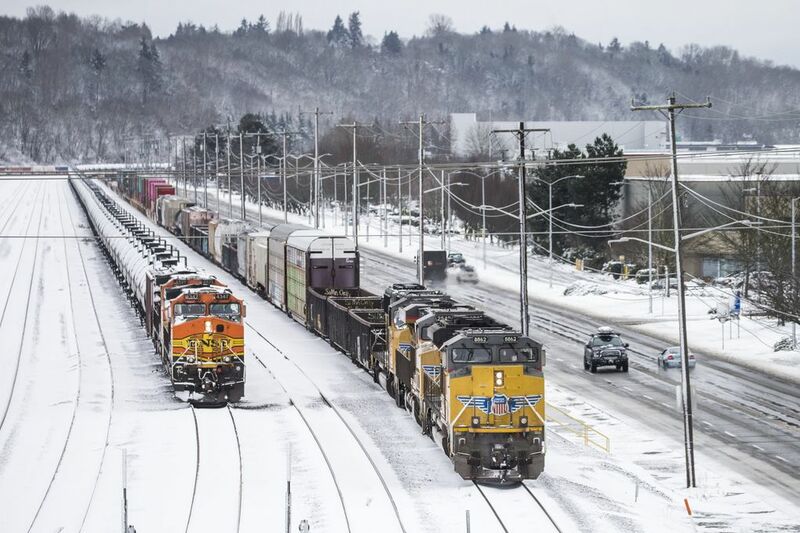 This winter’s first measurable snowfall in Puget Sound resulted from a combination of cold air arriving from British Columbia and a deep low-pressure system traveling south along the coast to bring precipitation. 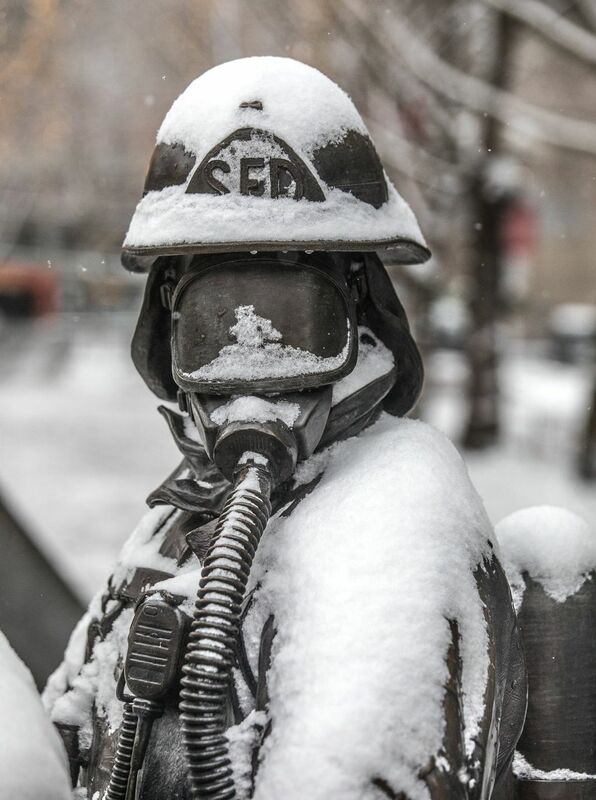 Temperatures early in the workweek are expected to be 10 to 15 degrees cooler than normal, with highs through Wednesday in the 30s and lower 40s, and low temperatures dipping into the teens, according to the weather service. 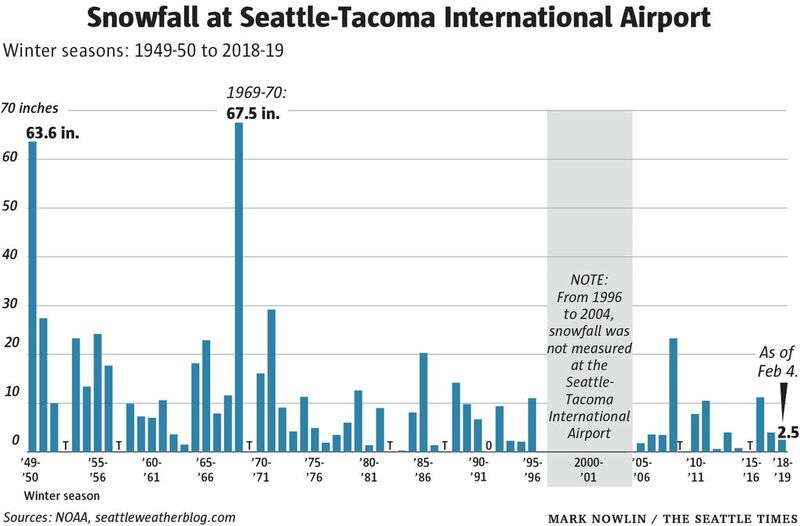 Seattle, a city that averages just 5.9 inches of snow each winter, according to the Seattle Weather Blog, has not done well with snow historically. 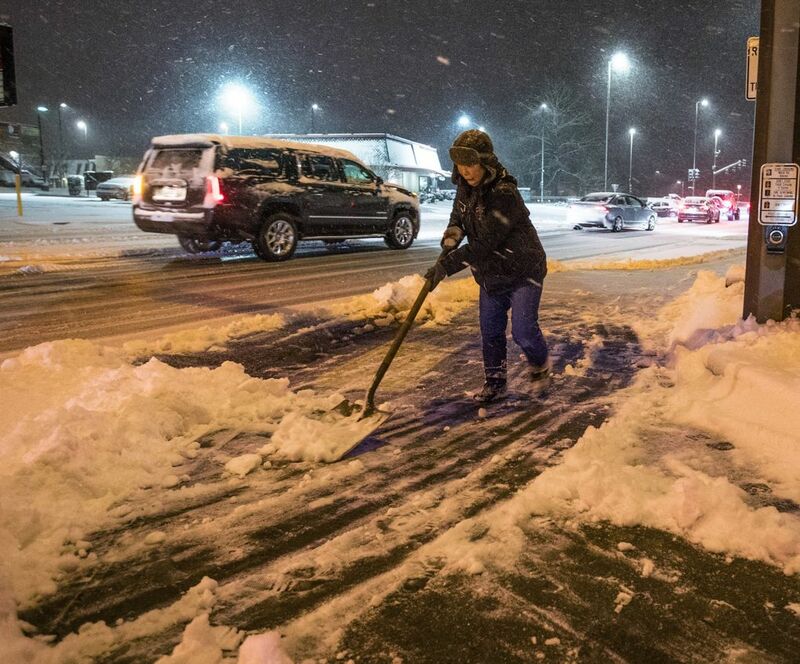 In 201o, a storm struck in the afternoon on Nov. 22 and dumped more than 6 inches, turning the rush-hour commutes into hourslong ordeals for some. Two years before that, a storm hit that sent one tour bus sliding down a steep Capitol Hill street to hang over the edge of Interstate 5. 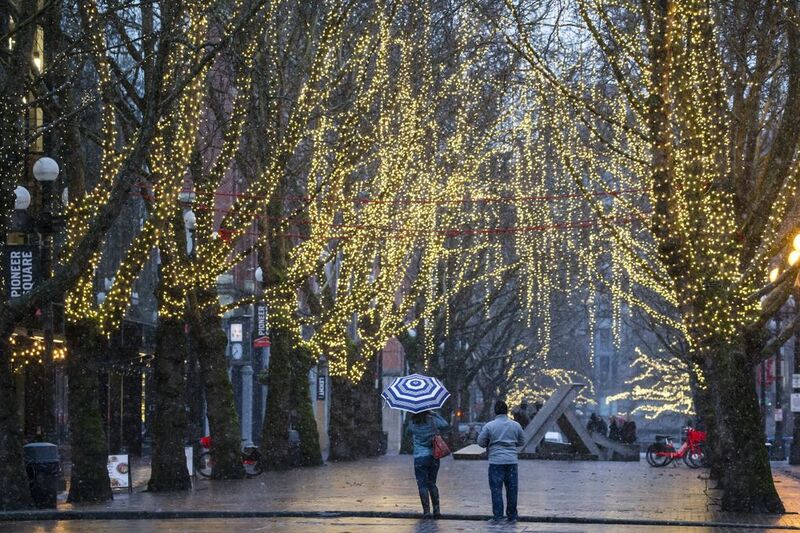 The storm was ultimately credited with playing a role in one Seattle politician’s demise. 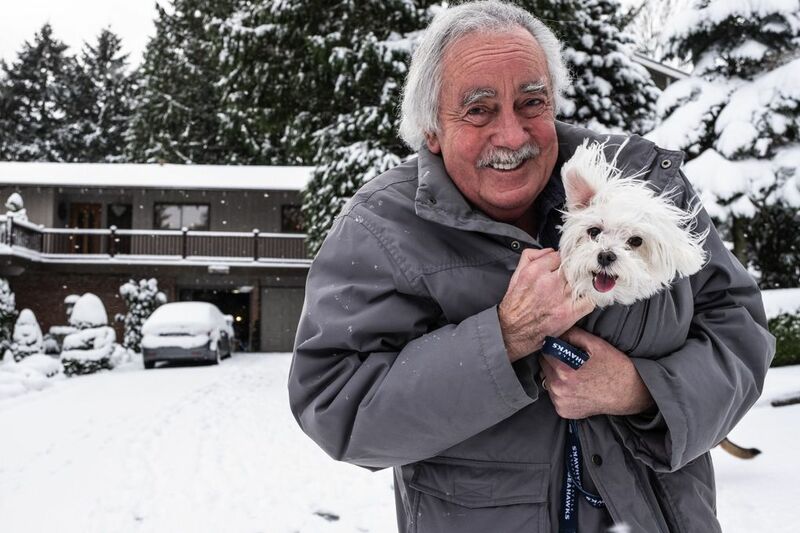 The two managers who were then in control of the city’s snowplows had no experience directing a major snow response and worried most about clearing the streets in West Seattle, where former Mayor Greg Nickels, former Deputy Mayor Tim Ceis and one of the city’s transportation chiefs lived. 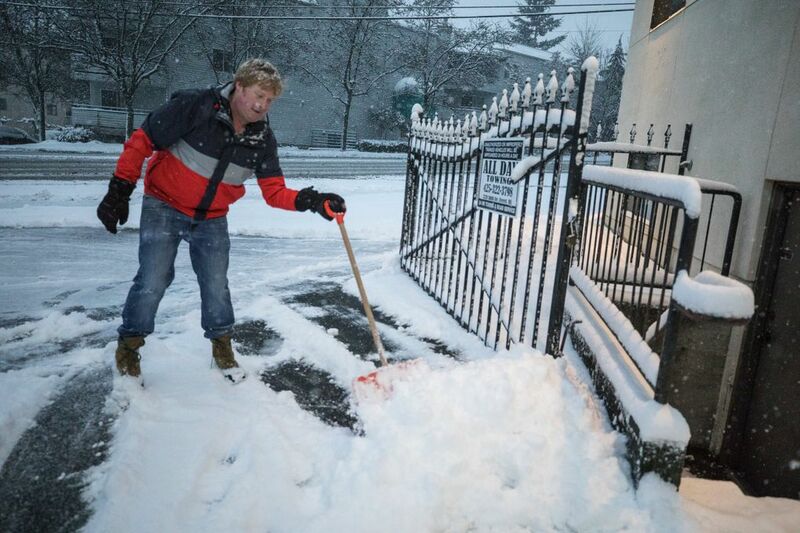 Nickels lost his bid for re-election in part due to the city’s handling of the snowstorm, according to some political observers. Staff reporters Crystal Paul and Katherine Long contributed to this report. Tips on how to stay safe when the power goes out. Plus, information in several languages about the dangers of carbon-monoxide poisoning. 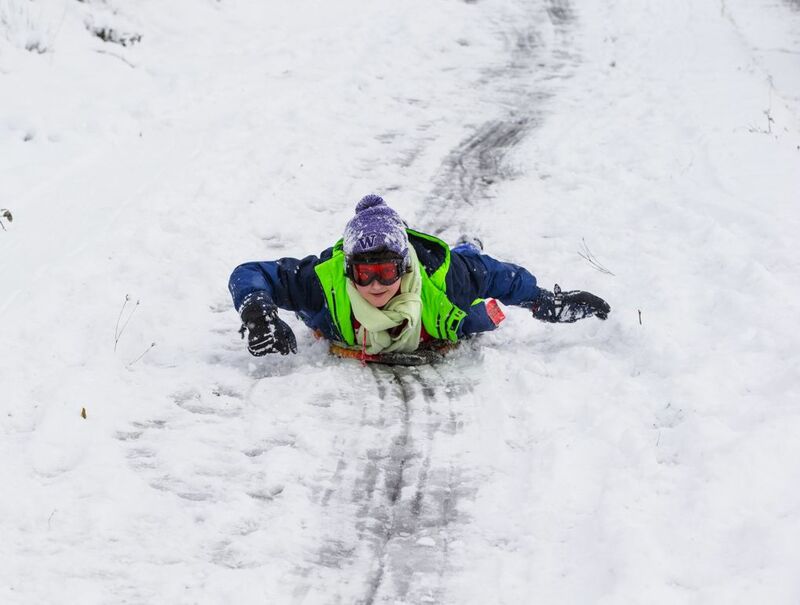 Parents: How are you handling the snow day?